Aung San Suu Kyi at Irrawaddy LitFest in Mandalay, Myanmar. YANGON, MYANMAR—A few weeks ago, while I was up in Mandalay for the Irrawaddy LitFest, I attended my first public event in the presence of Aung San Suu Kyi. 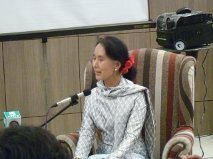 Yes, “The Lady”: Burma’s democracy icon, Nobel laureate, and living legend. Scion of legendary independence hero/martyr Aung San. Exemplar of peaceful, non-violent resistance who spent the better part of two decades under house arrest. Heroine who left behind her family and comfortable life in the West to pursue her destiny as champion for democracy in Burma. That Aung San Suu Kyi. Although my perception of “Daw Suu” has evolved over the years, I was no less fascinated by the prospect of seeing her in the flesh now than I might have been twenty years ago, had I actually visited Burma during the darkest days of the dictatorship, camped outside her University Avenue home and stole a glimpse of her in detention. For there is no denying that, from her very first public speech at Shwedagon Pagoda through her party’s election win in 1990 (a victory of which the country was robbed), to her long-awaited arrival in parliament twenty-two years later and high-profile, globe-trotting career since then, a cult of personality has developed around Aung San Suu Kyi. And personality cults tend to reveal as much about the country and the culture from which they spring as they do about the human individual they sanctify. More than a quarter century after the pro-democracy uprisings that marked her debut on the world stage, Suu Kyi is still revered by most of her compatriots as the last great hope for a free and better Burma. Portraits of both she and her father — like those of the Great Helmsman in China or “Uncle” Ho in Vietnam — adorn living room calendars and teashop walls throughout Myanmar. Unlike those two other personality cults, however, the father-and-daughter cult contains none of the poisonous taint of the tyrant. Aung San, only thirty-two and at the height of his promise when he was assassinated in 1947, was cut down before he could be tarnished by the act of governing. His daughter has built her own legend by resisting, not leading, a dictatorship. So their cult “brand” is one of righteousness. One of the most famous women in the world, Suu Kyi has become for Myanmar the kind of national icon whose heroic narrative transcends ethnic, sectarian, and even military/civilian boundaries. After all these years (which have included attempts on her life), her mere existence is like a daily miracle. The fact that she has not only survived but also eclipsed her slain father’s lifespan by more than double—the luster of her symbolic power exceeding even that of the beloved “Bogyoke”—has turned her into a kind of mythical goddess figure. Thus her every public appearance is accompanied by the kind of manic hysteria and aggressive ardor one normally finds in a crowd of pubescent girls lusting after a favourite pop star. Being in the presence of greatness, of celebrity based on moral authority, creates its own form of frisson. It is a natural human instinct to want to be near that kind of greatness, as if to touch it even for a moment the bearer could learn, through osmosis, the secret source of its power. As Nadine Gordimer once said, likely referring to Nelson Mandela, “there is no moral authority like that of sacrifice.” Suu Kyi’s sacrifice has been significant, and is not to be minimized. The problem with her greatness, however, is that her moral authority has been undeniably, perhaps irretrievably, compromised in the last two years—a period that began with her formal entry into Myanmar’s quasi-civilian parliamentary system. To some extent, disillusionment was as inevitable as the personality cult itself. As writers like Timothy Garton Ash have pointed out, the passage from dissident critic to elected politician is never easy (unless you’re Mandela). Although she has yet to govern, Suu Kyi’s dented halo can be likened to that of Vaclav Havel, who was catapulted into the leadership of a crumbling Czechoslovakia within months of leaving prison. The celebrated playwright/resistance hero found that his own political capital began to hemorrhage the moment he converted from bard to politician, in the transition from the high ideals of Charter 77 to the harsh realities of administration. But Suu Kyi’s fall from grace is about more than merely being co-opted by a system. Some say the fall began the moment she registered the National League for Democracy for the Lower House elections in 2012 and ran for her seat as a Member of Parliament. (The NLD had cited long-held principles of fairness in boycotting the 2010 Upper House elections as a “sham.”) With the country still ruled by military men—in civilian suits, rather than army fatigues—Suu Kyi could not have participated in the new pseudo-democracy without at least playing ball with some of the same Tatmadawgenerals who had once plotted to kill her. Her only other choice, really, would have been to remain on the sidelines while everyone else legitimized the system. The deal with the devil she made, in sitting down for tea with those same generals, was to make no public appeal for truth and reconciliation hearings, and no calls for an official UN commission of inquiry into the military dictatorship’s litany of human rights abuses. Leaving aside global disappointment that justice would be denied to the SLORC/SPDC’s many victims, this was merely realpolitik at work: Suu Kyi knew that turning a spotlight onto military atrocities—thus starting a public debate about the dictatorship years—ran the risk of provoking the Tatmadaw, stoking its paranoia, and ending the brief experiment in electoral politics by prompting another coup. Two years later, however, this deliberate strategy of political expedience (in which Suu Kyi’s every decision is made with an eye on the 2015 election) has no doubt exceeded the wildest dreams of former general-turned-President Thein Sein. The Lady remains far removed from the actual levers of power, and doubts remain about her ability to force a constitutional amendment that would allow her to run for president next year. But as NLD leader, she is the parliamentary leader of the opposition and has the ear of every news reporter in the country. That—strengthened by her widespread popularity among the masses—should give her enormous leverage in her dealings with the Union Solidarity and Development Party administration. However, many believe she has squandered this opportunity by embracing the government’s approach to investment and development and by making public pronouncements on two issues that have shocked the international human rights community and progressive circles within Myanmar. To many people’s ears, The Lady has begun to sound like a stooge. Both issues involve ethnicity and reveal much about Suu Kyi’s perspective as a member of the ethnic majority Bamar, as a Buddhist, and as daughter of the man who founded modern Burma’s armed forces. Suu Kyi has always been assiduous in mentioning ethnic issues, visiting ethnic communities, and insisting that minority voices be included in Myanmar’s public sphere. She still talks about fairness and, to her credit, has ensured the NLD’s active commitment to national reconciliation and the peace process involving ethnic armed groups. However, she remains either non-committal or reactionary on two particular issues (while taking positions on others that leave ethnic communities vulnerable to both state and private exploitation). One argument says she would risk losing the 2015 election if she displayed the courage of her house arrest years in tackling them. Another says a principled stance would cement her legend as that of someone who is incorruptible and sees democracy without human rights and dignity as not worth fighting for. The first issue is the Myitsone Dam project, a massive hydroelectric power development deal with China that was signed during the dictatorship years. Designed to be the fifteenth largest hydroelectric power station in the world, at 1,310 metres in length and 139.6 metres in height, the Myitsone was supposed to pair up Burmese government contractors Asia World with the China Power Investment Corporation (CPI). However, public opposition to the project intensified after the election. Studies showed that Myitsone portended environmental and financial disaster for Myanmar: the project would displace entire ethnic communities due to massive flooding of the banks of the Irrawaddy River, destroying livelihoods and wildlife in the process. It posed an additional risk of massive human casualties in the event of an earthquake (the dam project area sits on the Sagaing fault line). All this while funneling most of the energy to the Chinese and providing little benefit to the Kachin locals most affected by the development. Six months after taking office in 2011, Thein Sein suspended the project for the duration of his administration. The decision seemed a promising sign of political change in Myanmar, as it marked the first time in memory that a Burmese government had actually listened to the people. But three years later, that suspension has come back to haunt Thein Sein and, perhaps more so, Suu Kyi. The Chinese, annoyed that Myanmar bailed on them in 2011, have returned equipment and managers to the project area in full confidence that they will soon resume operations. When Thein Sein refused to officially cancel Myitsone and instead left the decision for the next government, public outrage grew once again. Given her vocal opposition to the project during the junta years, and her August 11, 2011 statement in the midst of loud public opposition to the project before she was an MP (she urged authorities to review the dam construction and seek a result that would address the concerns of those trying to protect the Irrawaddy from industrial harm), Suu Kyi was now sounding like someone putting a finger in the air to test the political wind. Failing to declare a decisive position on Myitsone well before the 2015 election has reduced her to a poll-obsessed opportunist who only cares about winning; ethnic communities affected by the project must take a back seat. This is not the stuff of a Nobel laureate. Nor is her support of a copper mine project by a foreign multinational, in which she sided with police rather than anti-mine protesters who were arrested for opposing the project. More troubling than all this, however, has been Suu Kyi’s failure since 2012 to speak up for the ethnic Rohingya Muslims in Rakhine State, one of the most vulnerable and persecuted minorities in the world, a people who have been targeted by Buddhist mobs and forced out of their homes, with more than 200 killed and hundreds of thousands rendered homeless or forced into squalid IDP camps. Suu Kyi has not only failed to condemn state-sponsored ethnic cleansing in Rakhine State. She has also failed to speak out against Buddhist extremism in general; failed to condemn the “969” movement of monks who promote hatred and violence against Muslims; failed to come up with any policy or solution that might help end the violence; and failed to otherwise share any kind of wisdom or insight that could serve to defuse sectarian tensions and prevent a bloodbath—never mind the genocide of whichexperts say Rakhine State is at “extremelyhigh”risk. Failed, in effect, to show any sign of leadership on a critical human rights issue that might remind people why she was awarded a Nobel Peace Prize. To those in the international community who have supported Burma’s pro-democracy movement from the beginning, including those who worked for years with her late husband, Michael Aris, to secure her release from house arrest, Suu Kyi’s shocking decision to side with the government and the Bamar Buddhist majority to which she belongs (thus enabling nationalist extremism in Rakhine and elsewhere in Myanmar), is a betrayal and a moral failure of monumental proportions. It’s a betrayal of the Rohingya, obviously, but it’s also a betrayal of the first principles Suu Kyi was presumed to have embraced as a Nobel laureate, specifically the principle of the universality of human rights. Suu Kyi’s strategy of political expedience, coupled with cringe-making public pronouncements such as her support of a racist and xenophobic law against inter-religious marriage, has led many to assume that she has lost the plot and is now on the side of the oppressors. This is where things get interesting. First, what many of Suu Kyi’s critics in the West do not understand—and is very hard to grasp unless one has spent some time inside Myanmar—is the extent to which The Lady’s seeming indifference toward the plight of the Rohingya reflects the vast majority of public opinion in the country and is symptomatic of a larger problem: a racist, “siege mentality” that sees Buddhism threatened with extinction by the gradual encroachment of Islam. Most people either quietly resent the Rohingya or are openly hostile to their presence in the country. They often cite the 1982 citizenship law—a redraft by dictator Ne Win, calculated to write out of existence the Rohingya’s long history in Burma by referring to them as “Bengalis”—to justify calls to deport, disenfranchise, and otherwise disempower them. A quarter century later, a cynic might argue that she has proven this “love and devotion” to Myanmar all too well—but in the worst of ways. Suu Kyi may not have discarded human rights completely, but she has reduced them to secondary importance in Myanmar’s pursuit of development. In doing so, she has dismissed international concern by using anti-foreigner rhetoric that has familiar echoes of SLORC/SPDC xenophobia. In November, when the UN human rights committee announced a resolution calling for Rohingya citizenship rights, Suu Kyi did not reply directly. Instead, she got an NLD spokesperson to spell out her position. The party hack dismissed the UN resolution by denying the existence of Rohingya in Myanmar and arguing that such a resolution amounted to an assault on the country’s sovereignty and interference in its internal affairs. And so it appears that Suu Kyi has come full circle since 1988. Showing her true colours as a child of Burma, she could certainly not be accused now of being “a foreigner” in any sense, apart from her flawless, BBC accent in English. Somewhere up in the jungle-bound capital of Naypyidaw, in the walled-off compound where he can enjoy his final years free of consequence for his many crimes against humanity, former dictator Than Shwe must be having a good belly laugh at Suu Kyi’s expense. It was with this jaundiced view that I anticipated my first glimpse of The Lady in person on the morning of February 15. I was attending the Irrawaddy LitFest in Mandalay in two capacities: first as a journalist covering the event for the local independent newspaper where I work as an editor (as well as for my blog and for anyone else in Canada who might be interested), and second as an author who relished the novelty of mixing with other authors in an exotic international setting. Suu Kyi, who had appeared at the inaugural festival last year as its patron, was scheduled this year for two appearances: the first a conversation with British television presenter Dame Joan Bakewell, the second a panel discussion on literary heroes and villains with Jung Chang, Louis de Bernieres, Thaw Kaung, and Martha Kearney. Some critics saw The Lady’s inclusion in the festival agenda as inappropriate. By her own admission—and despite the many books published under her name—Suu Kyi is more politician than scribe, not really a “writer” in the all-encompassing sense with which most authors self-identify. Thus, the time and resources required to clear space for her in the programme could have been put to better use making room for exposure-starved Burmese writers. The Lady has enough speaking gigs already, such thinking went. However, Suu Kyi’s name and gravitas gave important legitimacy to a fledgling literary event at a time when the government was still wary of free expression. Her presence not only guaranteed audience numbers but also ensured media coverage that could, presumably, spill over into other festival events. By Saturday morning, her first appearance was shaping up to be a nightmare. Because the festival venue had been shifted at the last minute from the Kuthodaw Pagoda to the Mandalay Hill Resort Hotel, only a small meeting room was available for Suu Kyi’s conversation with Dame Bakewell. Because it would be the second session of the day, the room filled up for the first session as everyone was hoping to keep their seats for the main event. But nothing doing: festival director Jane Heyn, wife of former British ambassador Andrew Heyn, announced before the session that the room would be emptied at the end of it so that a security sweep could be done. What she didn’t say was that the room would then be refilled for Suu Kyi’s appearance on a priority basis, with festival guests at the top of the list. As I sat through the first session, a panel discussion on East-West literary interest, I pondered some of the celebrity mob scenes I had witnessed before this day. In November 2000, I was in Hanoi when Bill Clinton became the first sitting U.S. president to visit Vietnam since the end of the war. Students lined up for miles to see his motorcade arrive at Hanoi University; anyone who stepped through the barrier got tasered. Back in the Eighties, I had been to rock concerts where people swarmed the front of the stage to get closer to the likes of Mick Jagger, Roger Daltrey, David Bowie and Peter Gabriel. But the pandemonium I witnessed before and during Suu Kyi’s appearance in Mandalay was unlike anything I had ever seen. In a bid to be included among the audience, I waited after the end of the first session until most of the crowd had left the room. (That way, I could be close to the door when they started inviting people back in.) The tiny hallway outside the room was quickly filling up with people, making it harder to breathe. Among the crowd was John Casey, the Cambridge professor who had discovered Pascal Khoo Thwe, author of From the Land of Green Ghosts. “Part of me still can’t believe this is happening,” Casey told me, referring to Suu Kyi’s freedom of movement. Writers do not tend to be “fanatics” when it comes to public displays of celebrity worship—not unless we’re on the receiving end. So then who were all these people who had suddenly converged on the festival grounds, were filling the hallway and now threatened to overwhelm the event? They were members of the Mandalay chapter of the NLD—party activists I had noticed lining the hotel parking entrance when I arrived on my rented motorbike two hours before Suu Kyi’s scheduled appearance. Now that the time had come, all their pushing and shoving was making me nervous: the meeting room could barely fit a hundred seats, at most, and the number of people clamouring to get in was at least twice that number. “The Lady” arrives. Reporter Gawthrop centre rear. Safely inside, I waited as the room gradually filled and volunteers began blocking the entrance. The commotion in the room continued for several minutes, rising to fever pitch as Suu Kyi’s arrival drew near. When The Lady finally came through the door—radiant as ever in a silver and white patterned silk dress, her long black ponytail tied by a cluster of fresh red roses—she was immediately bathed in television camera lights and popping flash bulbs, the shouting growing louder with her every step down the room’s centre aisle. Surrounded by bodyguards who pushed their way through the crowd to make a path for her, she never lost her smile as he proceeded through the chaos, as if such mob scenes were perfectly normal. “The Lady” amid the crush of the crowd. When Suu Kyi finally got to the front stage area, she sat down in one of the two living room chairs facing each other while Dame Bakewell took the other. The two women leaned forward and, away from the microphones, began chatting as they waited for the room to calm down. But the noise continued. People kept shouting slogans and Suu Kyi’s name, to the point that the whole scene took on the sordid ambience of a freak show. After a minute or so of this, Jane Heyn took the microphone, followed by her husband, to ask everyone to sit down and be quiet. “We are here to listen to Daw Suu speak,” said the former British ambassador. “Please show respect.” After another plea in Burmese from a festival volunteer, the clamour finally ended and the two women got down to business. Once the informalities were out of the way (“Life was a lot quieter under house arrest,” quipped Suu Kyi, when Bakewell asked if she was getting used to such receptions), the actual conversation was a tame affair. Part of this was to be expected: as patron of the LitFest, Suu Kyi was not there to be grilled by her host. She may not have screened the questions in advance, but her NLD handlers would have insisted on no politics. That said, the interview’s focus on safe subjects, which mostly involved revisiting well-explored territory (Suu Kyi’s favourite books as a child, her father’s influence, how she kept busy during house arrest) made for fairly boring listening. The Lady’s polite British interrogator kept lobbing softies at her. When Suu Kyi said: “Respect for the people means respect for human beings and human rights,” no one in the room snorted with derisive irony or shouted out “What about the Rohingya? !” This was not the event, and certainly not the crowd, for that. When the interview ended, the crowd stood again, the adulatory shouting began afresh, and the living legend walked out of the room.